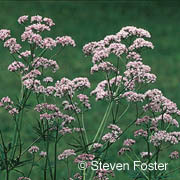 Valerian has been used to ease insomnia, anxiety, and nervous restlessness since the second century A.D. It became popular in Europe in the 17th century. It has also been suggested to treat stomach cramps. Some research -- though not all -- suggests that valerian may help people with insomnia. Germany's Commission E approved valerian as an effective mild sedative and the United States Food and Drug Administration listed valerian as "Generally Recognized As Safe" (GRAS). Scientists aren't sure how valerian works, but they believe it increases the amount of a chemical called gamma aminobutyric acid (GABA) in the brain. GABA helps regulate nerve cells and has a calming effect on anxiety. Drugs such as alprazolam (Xanax) and diazepam (Valium) also work by increasing the amount of GABA in the brain. Researchers think valerian may have a similar, but weaker effect. Valerian is a popular alternative to prescription medications for sleep problems because it is considered to be both safe and gentle. Some studies show that it helps people fall asleep faster and feel that they have a better quality of sleep. One of the best designed studies found that valerian was no more effective than placebo for 14 days, but by 28 days valerian greatly improved sleep for those who were taking it. Some researchers now think you may need to take valerian for a few weeks before it begins to work. However, in another study, valerian was more effective than placebo almost immediately. Other studies show that valerian reduces the time it takes to fall asleep and improves the quality of sleep. Unlike many prescription sleeping pills, valerian may have fewer side effects, such as morning drowsiness. But not every study has found that valerian had a positive effect. One review of several studies found that valerian probably doesn't work to treat insomnia. So the evidence remains contradictory. Valerian is often combined with other sedating herbs, such as hops (Humulus lupulus) and lemon balm (Melissa officianalis), to treat insomnia. In one study of postmenopausal women, a combination of valerian and lemon balm helped reduce symptoms of insomnia. Valerian is a perennial plant that is native to Europe and grows up to 2 feet tall. It is grown to decorate gardens, but also grows wild in damp grasslands. Straight, hollow stems are topped by umbrella-like heads. Its dark green leaves are pointed at the tip and hairy underneath. Small, sweet-smelling white, light purple, or pink flowers bloom in June. The root is light grayish brown and has little odor when fresh. The root of the plant is used as medicine and is pressed into fresh juice or freeze-dried to form powder. Valerian fluid extracts and tinctures are sold in alcohol or alcohol-free (glycerite) bases. Powdered valerian is available in capsule and tablet form, and as a tea. Valerian root has a sharp odor. It is often combined with other calming herbs, including passionflower (Passiflora incarnata), hops (Humulus lupulus), lemon balm (Melissa officinalis), skullcap (Scutellaria lateriflora), and kava (Piper methysticum) to mask the scent. However, kava has been associated with liver damage, so avoid it. Valerian is often standardized to contain 0.3% to 0.8% valerenic or valeric acid, although researchers aren't sure that these are the active ingredients. Preliminary studies suggest that valerian may help improve concentration and impulsiveness among primary school children. DO NOT give valerian to a child without first talking to your doctor. For insomnia, valerian may be taken 1 to 2 hours before bedtime, or up to 3 times in the course of the day, with the last dose near bedtime. It may take a few weeks before the effects are felt. Tea. Pour 1 cup boiling water over 1 teaspoonful (2 to 3 g) of dried root, steep 5 to 10 minutes. Tincture (1:5). 1 to 1 1/2 tsp (4 to 6 mL). Fluid extract (1:1). 1/2 to 1 tsp (1 to 2 mL). Dry powdered extract (4:1). 250 to 600 mg.
Once sleep improves, keep taking valerian for 2 to 6 weeks. Valerian is generally regarded as safe. Most studies show no harmful effects on fertility or fetal development, but more research is needed. Experts advise pregnant and nursing women to avoid taking valerian. Some people may have a paradoxical reaction to valerian, feeling anxious and restless after taking it instead of calm and sleepy. For most people, valerian does not appear to cause dependency. Nor does it cause withdrawal symptoms for most. But there are a few reports of withdrawal symptoms when valerian has been used over very long periods of time. If you want to stop taking valerian, lower your dose gradually rather than stopping all at once. Don't use valerian while driving, operating heavy machinery, or doing other things that require you to be alert. Don't use valerian for longer than 1 month without your health care provider's approval. If you are currently being treated with any of the following medications, you should not use valerian without talking to your health care provider. Valerian may slow down how quickly certain drugs are broken down by the liver. Many medications rely on the liver to break them down, so it's possible that in some cases, too much of these drugs could build up in the body. To be safe, ask your doctor before taking valerian if you are also taking any other medications. The same is true of other herbs with a sedating effect, such as chamomile, lemon balm, and catnip. Valerian may increase the effects of anesthesia. If you are having surgery, it is important to tell your doctors, especially your surgeon and anesthesiologist, that you are taking valerian. The doctors may recommend you slowly lower the dose of valerian before surgery. Or, they may allow you to use valerian up to the time of surgery, making any needed adjustments to the anesthesia. Ang-Lee MK, Moss J, Yuan CS. Herbal medicines and perioperative care. JAMA. 2001;286(2):208-216. Bagheri-Nesami M, Gorji MA, Rezaie S, Pouresmail Z, Cherati JY. Effect of acupressure with valerian oil 2.5% on the quality and quantity of sleep in patients with acute coronary syndrome in a cardiac intensive care unit. J Tradit Complement Med. 2015;5(4):241-247. Bent S, Padula A, Moore D, Patterson M, Mehling W. Valerian for sleep: a systematic review and meta-analysis. Am J Med. 2006;119(12):1005-1012. Review. Coxeter PD, Schluter PJ, Eastwood HL, Nikles CJ, Glasziou PP. Valerian does not appear to reduce symptoms for patients with chronic insomnia in general practice using a series of randomised n-of-1 trials. Complement Ther Med. 2003;11(4):215-222. De Feo V, Faro C. Pharmacological effects of extracts from Valeriana adscendens Trel. II. Effects on GABA uptake and amino acids. Phytother Res. 2003;17(6):661-664. Donath F, Quispe S, Diefenbach K, Maurer A, Fietze I, Roots FI. Critical evaluation of the effect of valerian extract on sleep structure and sleep quality. Pharmacopsychiatry. 2000;33(2):47-53. Ernst E, Pittler MH, Wider B, eds. The Desktop Guide to Complementary and Alternative Medicine: An Evidence-Based Approach. 2nd ed. New York, NY: Elsevier Mosby;2006:160-162. Ernst E. Herbal medications for common ailments in the elderly. Drugs Aging. 1999;15(6):423-428. Ferri F. Ferri's Clinical Advisor 2009. 1st ed. Philadelphia, PA: Elsevier Mosby; 2009. Gromball J, Beschorner F, Wantzen C, Paulsen U, Burkart M. Hyperactivity, concentration difficulties and impulsiveness improve during seven weeks' treatment with valerian root and lemon balm extracts in primary school children. Phytomedicine. 2014;21(8-9):1098-1103. Gyllenhaal C, Merritt SL, Peterson SD, Block KI, Gochenour T. Efficacy and safety of herbal stimulants and sedatives in sleep disorders. Sleep Med Rev. 2000;4(3):229-251. Heiligenstein E, Guenther G. Over-the-counter psychotropics: a review of melatonin, St John's wort, valerian, and kava-kava. J Am Coll Health. 1998;46(6):271-276. Holst L, Nordeng H, Haavik S. Use of herbal drugs during early pregnancy in relation to maternal characteristics and pregnancy outcome. Pharmacoepidemiol Drug Saf. 2008;17(2):151-159. Kakehashi A, Kato A, Ishii N, et al. Valerian inhibits rat hepatocarcinogenesis by activating GABA (A) receptor-mediated signaling. PLoS One. 2014;9(11):e113610. Leatherwood PD, Chauffard F, Heck E, Munoz-Box R. Aqueous extract of valerian root (Valeriana officinalis L.) improves sleep quality in man. Pharm Biochem Behavior. 1982;17(1):65-71. Miyasaka LS, Atallah AN, Soares BG. Valerian for anxiety disorders. Cochrane Database Syst Rev. 2006;(4):CD004515. Modabbernia A, Akhondzadeh S. Saffron, passionflower, valerian and sage for mental health. Psychiatr Clin North Am. 2013;36(1):85-91. Rakel D, ed. Intergrative Medicine. 3rd ed. Philadelphia, PA: Elsevier Saunders; 2012. Stevinson C, Ernst E. Valerian for insomnia: a systematic review of randomized clinical trials. Sleep Med. 2000;1(2):91-99. Taavoni S, Nazem Ekbatani N, Haghani H. Valerian/lemon balm use for sleep disorders during menopause. Complement Ther Clin Pract. 2013;19(4):193-196. Taibi DM, Landis CA, Petry H, Vitiello MV. A systematic review of valerian as a sleep aid: Safe but not effective. Sleep Med Rev. 2007;11(3):209-230. Taibi DM, Vitiello MV, Barsness S, Elmer GW, Anderson GD, Landis CA. A randomized clinical trial of valerian fails to improve self-reported, polysomnographic, and actigraphic sleep in older women with insomnia. Sleep Med. 2008;10(3):319-328. Wagner J, Wagner ML, Hening WA. Beyond benzodiazepines: alternative pharmacologic agents for the treatment of insomnia. Ann Pharmacother. 1998;32(6):680-691. Wong AH, Smith M, Boon HS. Herbal remedies in psychiatric practice. Arch Gen Psychiatr. 1998;55(11):1033-1044. Yao M, Ritchie HE, Brown-Woodman PD. A developmental toxicity-screening test of valerian. J Ethnopharmacol. 2007;113(2):204-209. Ziegler G, Ploch M, Miettinen-Baumann A, Collet W. Efficacy and tolerability of valerian extract LI 156 compared with oxazepam in the treatment of non-organic insomnia--a randomized, double-blind, comparative clinical study. Eur J Med Res. 2002;7(11):480-486.